I have had several requests for a summary of our journey with Grayson thus far, and since I have quite a few new readers, I thought it would be a good idea to write one so people can understand where we’ve been and where we are now. Grayson was born full term, at 37 weeks, 5 days gestation on September 22, 2010. The only issue I had in pregnancy was from 35 weeks on, I measured several weeks behind. My belly was small, and a growth ultrasound revealed Grayson was small, but no other issues were found. Labor was induced several hours after my water broke. I had a relatively easy vaginal delivery, with an epidural- Grayson was born 5 pounds, 7 ounces, and somewhere between 15 and 19 inches (because every nurse that measured him had a different number those first few weeks). Grayson was sleepy, sleepy, sleepy those first few days- I simply could not keep him awake to eat. He was hospitalized for almost a week at 5 days old due to dehydration and hypothermia. At his 5 day old doctors appointment his weight was down to 4 pounds, 9 ounces and his temperature was 94.9. Although we didn’t know it at the time, and neither did any doctor, this was most likely his first metabolic crisis. When Grayson was 3 months old, I had a conversation with our pediatrician about Grayson’s eyes. He wasn’t tracking or grabbing at objects with his hands. She referred us to an opthamologist, who pointed out Grayson’s nystagmus (side to side eye movements) and discovered his optic nerves were very small. He diagnosed him as legally blind, and ordered an MRI of his brain to see if there were any other issues. The MRI revealed a very thin corpus collosum, the band of nerves that connects the right and left hemispheres of the brain, and delayed myelin maturation. We were referred to endocrinology, who later refused to see Grayson because the bloodwork that was ordered after the MRI came back “normal”. Of course, we knew that our child was not “normal”. By this time we had started therapy through ECI and it became obvious that Grayson was not meeting his milestones. At 19 months, he cannot sit up, crawl, walk, or talk. At the recommendation of our OT, we made an appointment with a pediatric neurologist, which was one of the best decisions we could have made. Our neurologist is very aggressive, and although after every appointment we leave with another order for bloodwork, we are so grateful that he has pushed so hard for answers. One of the blood tests he ordered was for lactic and pyruvic acid, which both came back high. High levels of these are markers for Mitochondrial Disease. Grayson had his first seizure exactly 1 week after his first birthday. It was the scariest moment of my life- I thought he was dying. I called 911 and he was taken to the ER and the ruled it a febrile seizure. I’m still not sure that’s what it was, since he has had seizure activity ever since. He has had 2 EEGs, one at 7 months (normal) and one at 13 months (abnormal). He is on medication to control the seizures, but still has a lot of myclonic jerks and clonus in his feet. From the time he was born, Grayson has had a lot of trouble eating and gaining weight. He was never that interested in his bottles, and would never drink more than 3 oz. at a time. We upped the caloric concentration of his formula hoping that would help him gain weight, but we didn’t have much success. Solids were also a struggle. In October of 2011, Grayson started vomiting many times a day- violent, projectile vomit. He was hospitalized for 9 days, diagnosed failure to thrive and with delayed gastric emptying, and was put on an NG feeding tube. He had his NG tube for 7 weeks, and then had surgery to get his G-tube. Currently, he is 100% tube fed, 22 hours/day. We are working on getting him to eat by mouth again, but it’s a slow, slow process. We saw a geneticist in November 2011, who also suspected Mitochondrial Disease. He ordered a muscle biopsy. Grayson had the surgery in January 2012. After we got the results of the surgery we saw a Mitochondrial Disease specialist who diagnosed him with Mito on April 20, 2012. We are currently waiting on results of a genetic test which will hopefully give us more information as to what type of Mito Grayson has. Grayson will also be having many more tests in the coming months to gather information about his disease and prognosis. Grayson’s list of issues is long- vision and hearing impairment, developmental delays, muscle weakness, seizures, gastrointestinal problems, and speech delay. I think he now has more specialists than I have fingers. His diagnosis of Mitochondrial Disease is devastating, but we will not let it devastate our son or our family. Grayson is pure joy, and he is so much more than his diagnosis and his health issues. 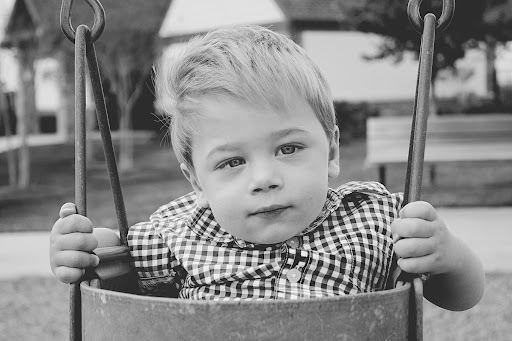 He has an infectious giggle, loves to cuddle and swing at the park, adores music, and we could not love him more. I know is just the beginning of Grayson’s story…God is going to do amazing things through this little boy. Wow…my daughter's story is SO similar to Grayson's! We noticed around 3mo she wasn't tracking and she was also a terrible eater (eating 2-3 oz only when forced). But her seizures started much earlier at 5mo (myoclonic-infantile spasms). Even the way she ended up with her g-tube is the same. It's amazing to see this all in one place, what a journey over these last 19 months. Interesting how it always makes more sense looking backwards…Beautifully written, as always. Looking forward to the next steps in the travel and for his continued progress! I really appreciate the summary. I started following a few months ago so this was VERY helpful! Your family has been on quite a journey already and I'm just hoping the next phase is full of answers and improvement. I love the recap! Of course if you'd done this when we "met" earlier this week then I wouldn't have spent 3 days reading all the past post to get to know your sweet boy! Lol!!! I continue to follow your amazing journey. Your family will always be close to my heart. An amazing journey full of ups and downs. I think the coolest thing Grayson is know for is being a little missionary – he moves people to pray and be thankful in all circumstances! He has impacted so many lives and he isn't even 2 yet- your G-man ROCKS! Love and hugs to you all! I also thank you for doing a recap. It makes it easier to understand where you – and Grayson – are know to know where you've been thus far. I know that as mamas we do whatever we have to do to take care of our babies. But, mama, you've done so much. How blessed you and Grayson are to have each other! Grayson is lucky to have such a loving and supportive family. He is precious. He has the two most wonderful parents in the world ! What a sweet boy ! !